Vitesse will enter the new Eredivisie campaign low on confidence after falling to Basel in the first leg of their Europa League tie on Thursday evening. Vitas were the better side on the pitch throughout the 90 minutes of play, but they just failed to convert a host of huge goal-scoring chances in front of the Swiss team’s goal. They were brutally punished with a goal in the stoppage time as Swiss Super League runners-up gained a decent advantage ahead of the rematch on their soil. Can Leonid Slutsky find the way to lift the spirits in the dressing room ahead of the Eredivisie opener against Groningen? Vitesse head into the game as the bookies’ favourites as they enjoyed a much better league campaign last year. They were also pretty impressive in the final third in the second round of Europa League qualifications even though the draw gave them a tricky opposition in the likes of Romanian Viitorul. Vitas bagged five goals in two legs there to back up the impressive 0-3 victory over Lokomotiv Moscow in a friendly earlier on. Vitas lead the head to head tie by six wins ahead of their 51st encounter with the Pride of the North. Teams snatched a win apiece in the previous term of Eredivisie (both at home). Both teams found the net in three of last four head to head games. 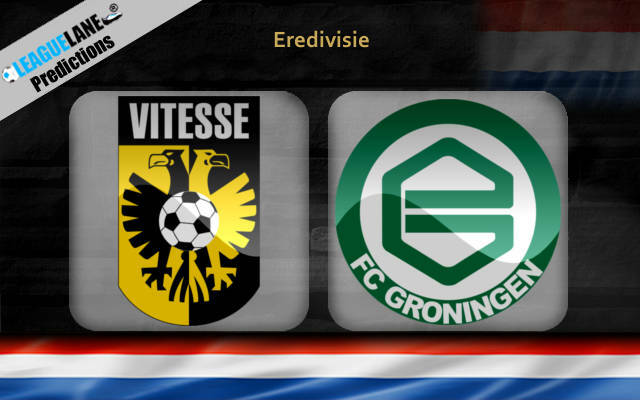 Vitesse won 14 and lost only 4 of 25 home outings against Groningen. The visitors had a disappointing campaign in the previous tern of Eredivisie. It resulted in a change on the bench as Danny Buijs took charge this summer. This will be the official debut on the bench for him. De Buijs can generally be satisfied with how his men kept things tight at the back in the pre-season. Groningen conceded only one goal in last two friendlies against De Graafschap and Werder Bremen. Nevertheless, the visitors will face a much more serious test here given that Vitas play ultra-attacking football. Even though the hosts failed to convert against Basel, you just have to admire their impressive attacking line led by Tim Matavz and Roy Beerens. When you sum it all up, the home win is the most realistic of three outcomes based on both teams’ quality and their head to head record in matches at GelreDome. Vitesse Over 1.5 Team Goals @ 1.57.